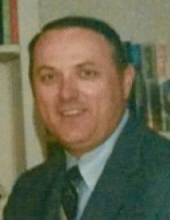 Albert E. "Duke" Forbes Jr. Celebrating the life of Albert E. "Duke" Forbes Jr.
Be the first to share your favorite memory, photo or story of Albert E.. This memorial page is dedicated for family, friends and future generations to celebrate the life of their loved one. Obituary for Albert E. "Duke" Forbes Jr.
Albert E. “Duke” Forbes, Jr., 79, of Niles, died Wednesday, July 11, 2018, at Chalet of Niles. Funeral services will be at 11 a.m. Saturday, July 14, at Allred Funeral Home, Berrien Springs, where friends may visit beginning at 10 a.m. Burial with military rites by Berrien Springs American Legion Stover-Wagner Post 85 will be in Rose Hill Cemetery, Berrien Springs. Memorial contributions may be made to Wounded Warriors. Duke was born November 9, 1938, in Chicago, the son of Albert and Virginia (Stowell) Forbes. He proudly served his country with the United States Marines. He was a life insurance salesman for Combined Insurance Company. His passion was fishing, and he loved to go looking for deer. With a partner, he created Sports Promotions which consisted of boat and sport shows at Notre Dame, and he was an avid Notre Dame fan. Survivors include his wife, Deana A. Forbes of Niles; daughter, Kelly Forbes of South Bend; sons, Brian Forbes of Surprise, Ariz., and William (Cathy) Forbes of Peoria, Ariz.; sister, Yvonne (Robert) Makowski of Merritt Island, Fla; grandchildren: Eugene Forbes of Centennial, Colo., Tyler Forbes of Phoenix, Ariz., LeAnn Forbes of Peoria, Ariz., Sarah Forbes of Surprise, Ariz.; and great-grandchildren, Damian and Greyson Forbes of Surprise, Ariz.
To send flowers or a remembrance gift to the family of Albert E. "Duke" Forbes Jr., please visit our Tribute Store. "Email Address" would like to share the life celebration of Albert E. "Duke" Forbes Jr.. Click on the "link" to go to share a favorite memory or leave a condolence message for the family.